One of the best campgrounds with a 120 foot waterfall on site! 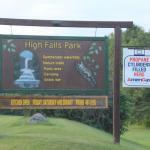 Our family has been camping at Highfalls Park now for over 20 years. We started camping at the annex for overnight campers and moved on to becoming seasonal campers. We never regretted this decision. 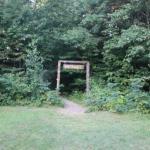 The sites are larger than in most campgrounds and there are lots of trees and foliage to give you enough privacy. Campers are very friendly and helpful. Washrooms are kept clean even though they are rustic. There is also a swimming pool and a nice playground near the entrance for the kids. There is a hiking path behind the main building with stairs that lead down to the 120 foot waterfall. Very picturesque! Bring your camera. Main building has a store with limited supplies and groceries and a restaurant in case you need a break from cooking. The main pavilion provides a place for activities and events. The town of Malone is about 20 minutes away in case you need to shop. It has a Price Chopper and a large Walmart. This hike is not for the faint of heart, as the steps are steep and long to get to the falls, but the trek is definitely worth it. The views are stunning, especially during this time when the leaves are changing. Interesting falls, if you find yourself in the area perhaps? I pulled into the High Falls park campground and walked up to the camp store/office. She was shutting down but I paid my $3 and walked through the back door to the trail. After winding along campers for awhile, the trail cuts into the woods and it was probably 20 minutes before I saw the falls. I was a bit disappointed that the top 2/3rds of the falls are a dam and the bottom portion is a fairly interesting natural falls formation. The trail continued down to the base, but I decided to turn around. This park was a bit out of the way, and as the sun was setting I debated staying here but decided to push on. Not sure i would seek it out, but if in the area, the admission was reasonable. This is a large campground with a lot of permanent campers. At first, it was not wildly impressive. 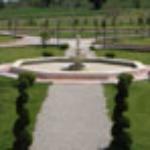 The campsites are spacious with lots of foliage offering more privacy than is typical. The biggest negative was really the bath house, which was old. But there was much else it had going for it. The walk to the Falls and then along the river was beautiful. People were very friendly, which helped us to get the most from being there. We happened to be there on a Saturday evening when they had a great local band playing at the Pavilion. They entertained for multiple music tastes from Johnny Cash to the Eagles. Many people of all ages were dancing. It was a great time and a lot of fun that we will remember. And they make an excellent breakfast sandwich. Even if you are not there on a Saturday as we were, we would still recommend this place. Get your walking shoes on and prepare to walk. The falls is nice to see from the top as well as from the bottom. There are lots of steps to go down......and then back up. When you get back up you can relax with a cold drink an ice cream or a sandwich if your hungry. makes for a nice afternoon adventure. Lots of shade trees too in case the sun is strong and a cool breeze by the water. had trailer there years ago after having searched all campsites in the area throughout upstate NY..this is the most beautiful most private most friendly site there is !